Description: A Meyda Tiffany original design, the round Fleur-de-Lite inverted pendant is an elegant design of Golden stylized three-petaled irises and Amber colored jewels. A stately Medieval hand crafted frame cradles the stained glass shade which is reminiscent of castle and cathedral glass. 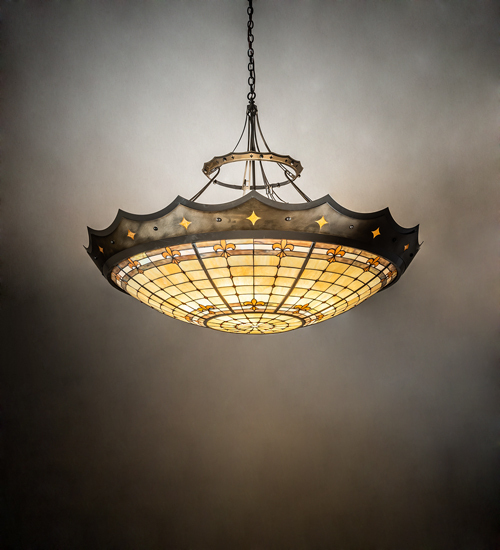 This fixture is finished in Timeless Bronze with Antique Copper, and is made in the U S A by Meyda craftsmen.